After one demo” We are the Dead” Per was replaced with Carsten Lohmann in late 83’ and Artillery made the 2 demos “Shellshock” and “Deeds of darkness” both from 1984. In 1985 Flemming Rönsdorf was added as the new singer, and Artillery made their debut album “Fear of tomorrow “on Neat Records. “Terror Squad” was recorded in 1986 and released after one year delay on Neat records in 1987. The delay also made the band split up in 5 months in sheer frustrations of waiting for the release. In late 88’ artillery got an offer to play in Russia and started to make new songs for the next album “By inheritance” who was released in 1990 on Roadrunner records. At that point Morten Switched from bass to guitar and new bass player Peter Thorslund was joining Artillery. After receiving a lot of tour offers, Flemming decided that he did not wanted to play so much live and the band was starting to fall apart. 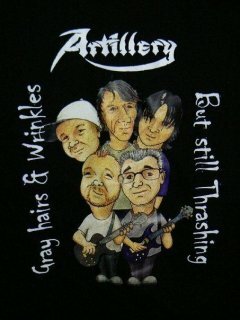 Artillery was disbanded in 1992 with a line up were only Morten and Peter was the original members from the “By inheritance” session. In 1998 Mighty records released the compilation “Deadly Relics” and on the same event the band played a mini concert in Vega. After the show Artillery was contacted by Die hard records, who wanted to release a new record. B.A.C.K was released in 1999 with the help of drummer Per Jensen (The Haunted etc.) and was more a project than a band. 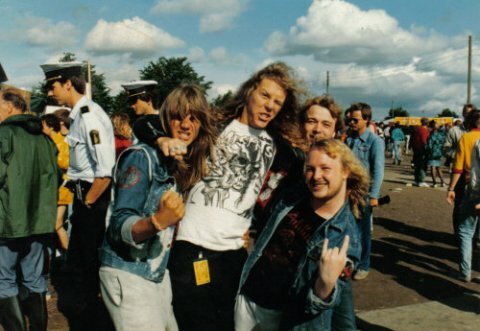 In 2000 Artillery played at Wacken open air with Per Jensen and Peter Thorslund. 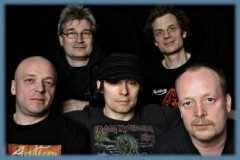 In 2004 Artillery played the last concert at the Rock with Flemming Rønsdorf, with the help of Hatespere bass player Michael Ehlers and drummer Anders Gyldenør . 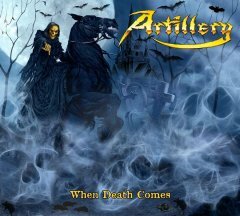 In 2007 Carsten, Peter, Morten and I decided to go on with Artillery but with a new singer On the same time Metal Mind in Poland was releasing a box set with all of the old Artillery Albums. New singer Søren Adamsen joined Artillery in late 07’ after 2 rehearsals. After 2 gigs Artillery recorded the DVD “One foot…..” In 2008. After touring a lot Artillery made “When death comes” in June 2009. Calle: You were one of the first thrash metal bands in Denmark/Europe. Was it hard getting a record deal back then? Michael: We had offers from 6 or 7 record companies beside Neat, so I guess it was not that difficult. But no record companies’ from Denmark were interested in Artillery. Michael: Morten and I started to listen to heavier stuff through a friend’s big brother, who introduced us to bands like Black Sabbath, Uriah Heep, Deep Purple, Slade etc. at the age of 11 - 12 years old. On that time we made our first band called Silver cross, we couldn’t play but it was fun trying! Michael: It comes from a lot of stuff raging from Johnny Winter, Jimi Hendrix, Jethro Tull to Black Sabbath, Judas Priest, Savartage and Metallica, Exodus, Slayer and even some old punk stuff like GBH just to name a few! Calle: There have been some changes in the band since you started. Why is that? Michael: It’s all the usual reasons I guess, some was not into the style, some was not committed to the band, and sometimes the chemistry didn’t work between the band members etc. Calle: You released your new (and 5th) studio album “When Death Comes” in 2009. How has the response from the critics and the fans been so far? Calle: You used Søren Andersen as producer for the album. How did you get to work with him? Michael: Søren, our singer, knew him and at the same time we wanted to use a different producer, than the other Danish bands so it was obvious to try him. He was very easy to work with and contributed with a lot of inputs! Michael: It have been very easy, we all been working as a unit. 4 of the songs were ready already in the start of 2008 and last ones were written in the last months before hitting the studio in March 2009. Michael: I really like all the songs, but if I have to choose one it would be “Upon my cross I crawl”. Calle: “When Death comes” is your first album with Søren “Nico” Adamsen as singer. How did you find him and how is he compared to Flemming? Michael: I called Torben Askholm (Anibus Gate at that time) and asked him to come for a rehearsal, but he couldn’t do it because of some throat problems. He told me to try Søren, because he thought he would fit perfectly into Artillery. He was right Søren is not only a good singer, but also a good friend you can party with. Also is he committed to the band, which Flemming weren’t. Calle: You’ll be playing some Danish live shows in March and April and some German festivals in May. 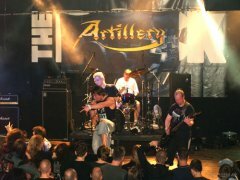 What can people expect when they go see Artillery live? Michael: A band who always try to deliver 100%. A band who loves to play this music. Calle: You’re headlining RamFest on March 27th with some upcoming and “younger” bands like Nightlight, Chainfist, Black Succubi, Forcentury, Neca, Vanity Ink (FI) and Neonfly (UK). What do you think of this kind of one-day metal events? Michael: I think it’s great and I hopping that people will support the show. The quality of the bands is very high and I know a lot of people have been asking for a show like this! SO BE THERE! Calle: What’s the most fun/crazy experience you have had during a show or tour? Michael: There has been a lot, but one of the craziest things was when we toured in Russia in 1989. We played at places like big theatre with around 4000 people. Half of them were military people and politicians and the other half were young head bangers dressed like heavy freaks. When we played our shows the fans invaded the stage and put all kind of symbols on us, like badges, cross etc. and someone even gave me the Russian flag to show their loyalty for Artillery. At one point there were so many at the stage that no one from the band could see each other. The military then started to beat all of them up and tried to stop them coming to the shows. But the next day they all came dressed up in smoking and tire and was head banging, that was strange! We played 5 concerts before we were disbanded by the Russian authorities and send home. Calle: Back when Metallica recorded “Master of Puppets” in Sweet Silence Studios (in Denmark) you seemed to be good friends with the guys. Did you ever think they would make it so big? Michael: We met Metallica first time when they recorded “Ride The Lightning”. At that time we shared rehearsal room with Merciful fate and while they were touring, Metallica was borrowing their part of it. I always thought that Metallica had something special to offer, and despite what many people say about them today I still think they deserve their success. After having a release party for WDC, James Hatfield and Michael from Volbeat was coming to say hello and drink a beer and that shows that he is still is very down to earth. I hope we can play a show with them one day. It would be great! Calle: How do you see the Danish metal scene now, compared to when you started? Michael: It’s a lot better and much easier to make an album today if you compare when we started, and the “Metal scene” is much bigger with a lot of different styles. Calle: Can you recommend some new Danish metal bands? Michael: Essence, Impalers, Serpent Saints and Unbelief just to name a few. There is a lot of bands who got potential for good songs, just go to Ramfest 27 March and you can see some of them! Calle: How would you describe each member of Artillery in only three words? Calle: Will Artillery still be around in 10 years? Michael: The plan is to release a new album then, no to be honest nobody knows. But as long as it is fun, we will be playing! Calle: What’s the best advice you can give to up-coming metal bands? Michael: Play with your heart; try to be original and work hard. Calle: What was the first LP you ever purchased? Calle: What’s your top 5 CD’s of all time? Michael: Slade as kid in 1974 followed by Kiss, Ted Nugent, Black Sabbath and AC/DC in 1976! Calle: Name one song you wish you had written and why? Michael: There are so many but maybe some of these. Jethro Tull: “My God”. Because Ian Anderson is a genius and this song shows that a song can be very complex and still be catchy. Calle: What do you do when not playing music? Michael: I work a normal daytime job, taking care of my family and have a great passion for football (FCK) and listening to a lot of music. Calle: Can you name one thing that you think only Danish people do? Michael: Using flags for nearly everything and in Danes always like to Hygge! Michael: THANKS a lot for your support!! !